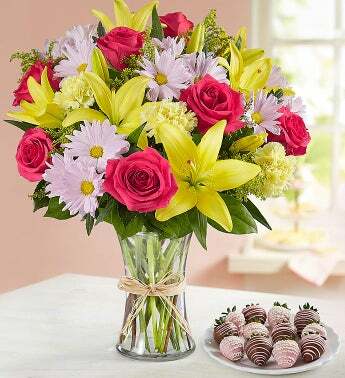 This delightful duo of blooms and berries was created with Mom in mind. Inspired by the vibrant colors of the European countryside, our best-selling bouquet pairs perfectly with a dozen of our Berrylicious juicy strawberries, dipped and decorated for a beautiful presentation. It’s all you need to make Mom’s day as special as she is!